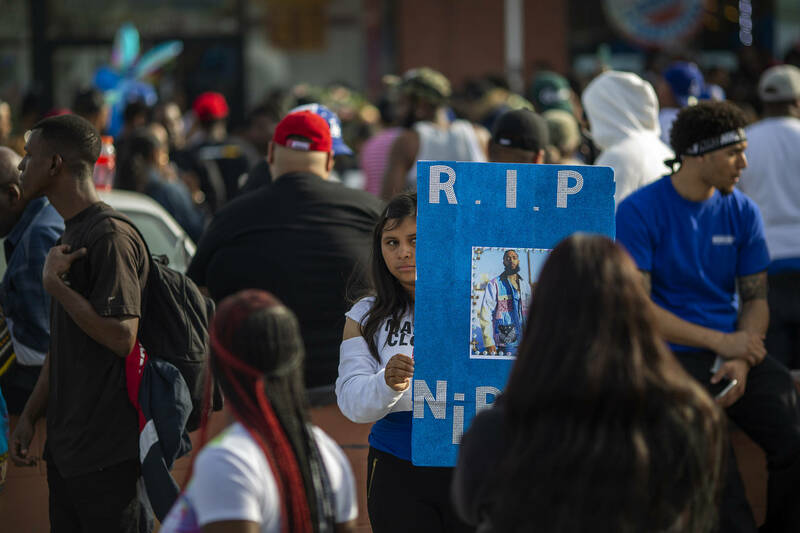 Over 20,000 people are scheduled to gather together on Thursday for Nipsey Hussle's memorial service, and ahead of the emotional event, the rapper's mother, Angelique Smith, sat down to share a moving message for the masses. The video was created for students, but after being shared throughout social media, everyone was blessed by her words. "Hello students, I'm Ermias' mother," Smith began. "Ermias is Nipsey Hussle. And I want you to know that I am so happy and that Ermias is here with me right now. I feel him. His spirit is right here with me, and I want you to know that death is not to be feared. I want you to know that we are spiritual beings first and we're having a physical experience. It only lasts for a moment in time." "When you die, as they call it, you are just becoming a baby in your spirit," she said. "You are just beginning to live your eternal life that never dies. Ermias will never. You have him in your heart. every time you think of Ermias, he lives. His spirit is everywhere now. You can talk to him and he will talk back to you in your mind," she said. "You will be able to feel his presence." "I don't want you to be traumatized. I want to tell you, Ermias was more beautiful in death than he was in life. Ermias didn't have any marks on him when I viewed him. His hair was perfect. There was not one strand of hair that was out of place. All of the love, all of the compassion, all of the caring, the truthfulness and the generosity, all of the honesty. All of the compassion...just all of the good things that were inside of Ermias' heart...it's as if they lifted off of his heart and they transferred to his face. His face was beautiful and had complete peacefulness." "When you walk this earth and you do good deeds for people, and you are loving and kind, those are the things that will show on your face. You will look more beautiful," Smith said int he video. "I have perfect peace, and I have strength, and I want to lift you up. Please do not stay down, do not stay stuck, do not mourn. Because Nipsey is great [...] and now he's even greater because he has no bounds and limits. His energy is everywhere. He's there with you now and he's here with me now and please be encouraged."